(P1) July was the hottest month on Earth since scientists started taking records 136 years ago. NASA said that: “July 2016 was absolutely the hottest month since the instrumental records began.” It beat the previous record, which was July 2011, by 0.11 degrees Celsius. Scientists say this is a big rise. 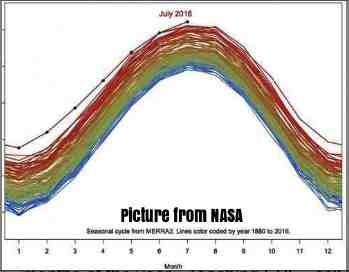 NASA said July was the tenth straight month of record-breaking temperatures. The year 2016 could now become the hottest year on record. (P2) The website gizmodo.com said July could be the hottest month since prehistoric times, the hottest in 125,000 years. A weather expert said: “It’s a little alarming…that we’re going through these records like nothing this year.” The organization Climate Central reported that the record temperatures are because of fossil fuels and El Niño. However, an Australian politician recently said climate change was a conspiracy theory created by NASA. Do you agree or disagree with the Australian politician that climate change is a conspiracy theory? Why? Do you think it’s a little alarming that record-breaking high temperatures are occurring frequently? Why or why not? What do you think can be done to stop climate change? How long ago did scientists begin to log temperatures? Which internet site is mentioned in the article? What are the 2 reasons given by Climate Central for the record-breaking temperatures? Who supposedly started the conspiracy theory about climate change?